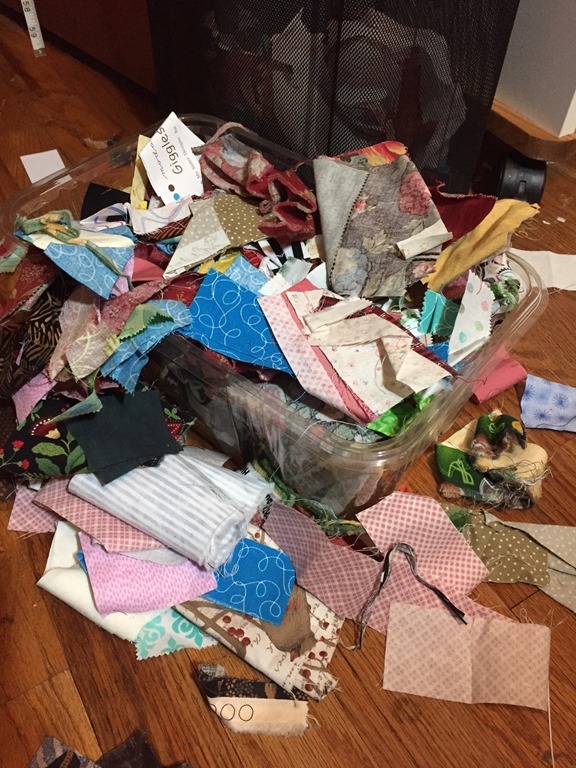 Do you, like me, have tons of scrap fabric you’ve been saving to use…someday? I’m embarrassed (or proud?) 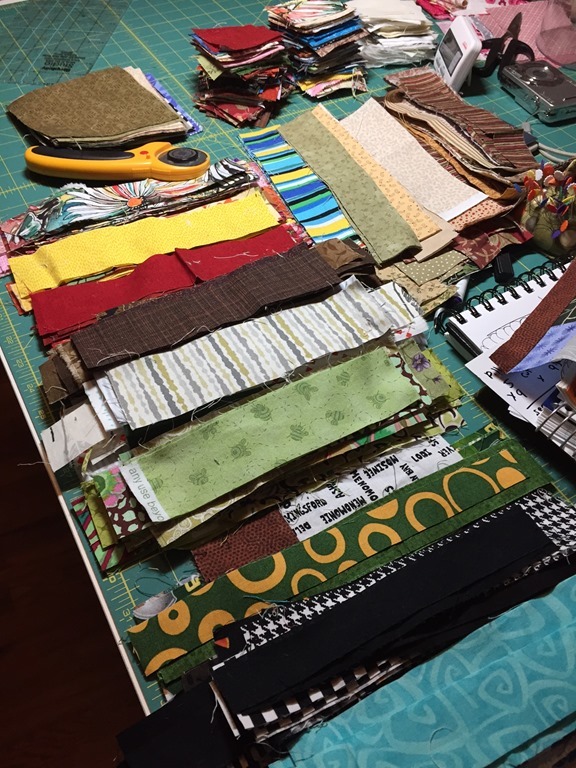 to tell you that my stash of scraps takes up two bookshelves in my sewing studio. They’re nicely sorted by color, and look very pretty, but one of my New Year’s Resolutions this year is to start using up my scraps. Not that I won’t create more scraps that’ll grow yet again—but I need to use them up before they take over my studio! I was watching a TV program on Sewing with Nancy—click here to view the episode on PBS with Nancy Zieman that featured a guest speaker with great ideas for using up those scraps. 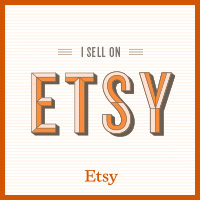 Lynn Harris has written a quilt book entitled, “Every Last Piece” (see Amazon here). 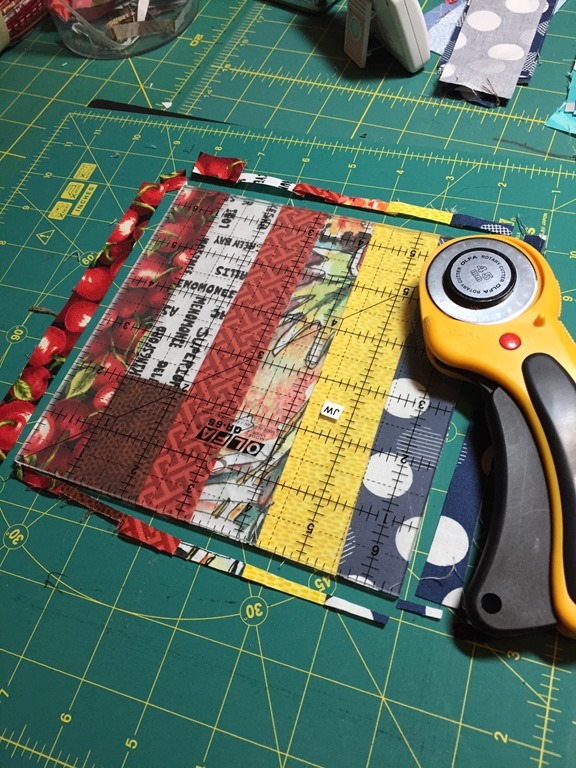 She suggests cutting your scraps into strips of various widths and sewing them together, and cutting them to size with a standard 6-1/2 inch square ruler. 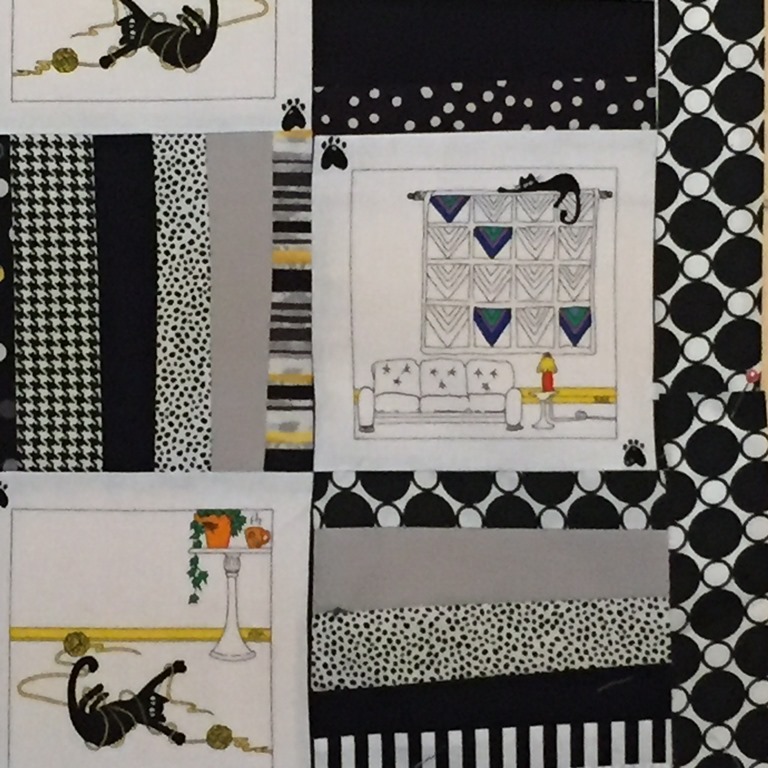 These squares can be used in any traditional quilt pattern out there. Genius! 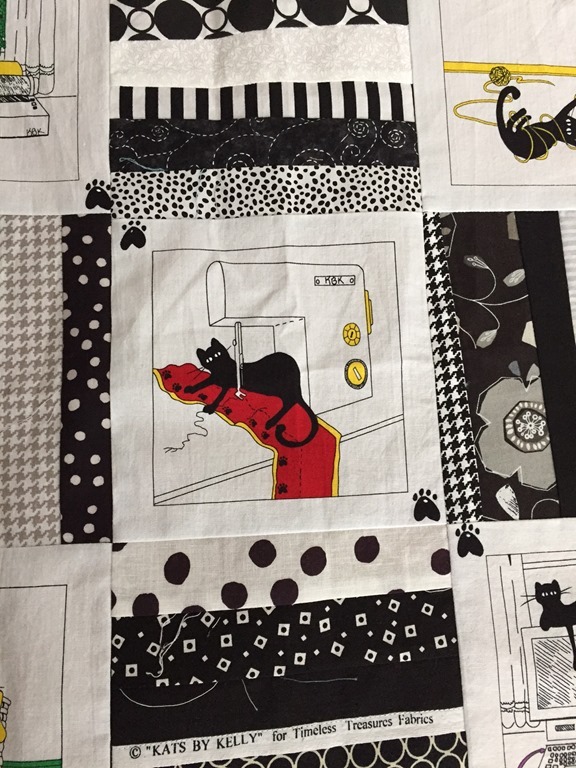 I was completely enamored with the first quilt she showed on the program—The Garden Window Quilt. But there were so many more possibilities! 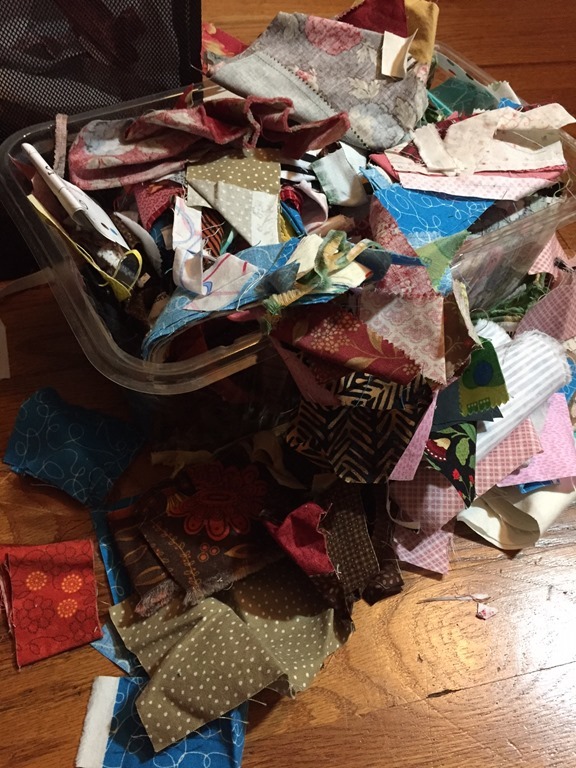 These are the smallest of the scraps I keep—they’re not even big enough to be sorted in my bins by color. They are spewing out of washed salad tubs where I store all the “orphan” bits and bobs. 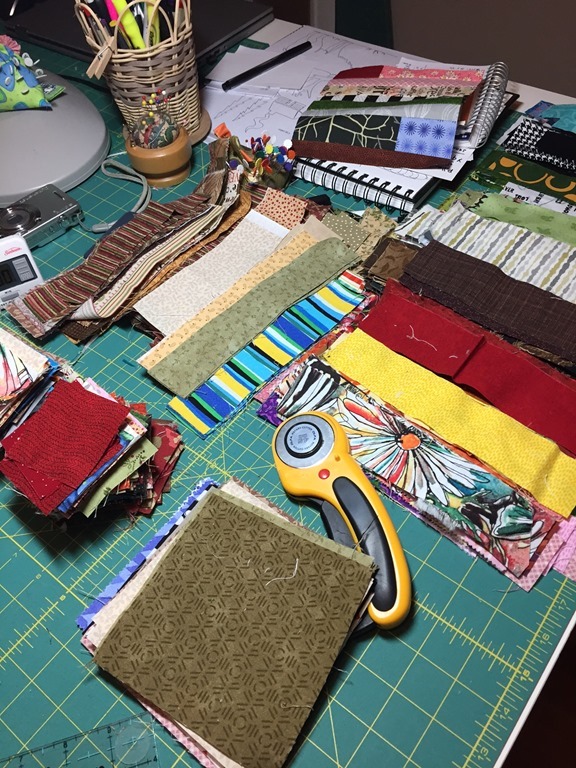 I spent an afternoon with my music blaring cutting all those scraps (every last piece) into various sizes—5 inch & 2-1/2 inch squares, & long 2-1/2 inch strips. These were put away for another day. But anything smaller was cut into strips of different widths (all under 2-1/2″) and at least 6-1/2″ long. 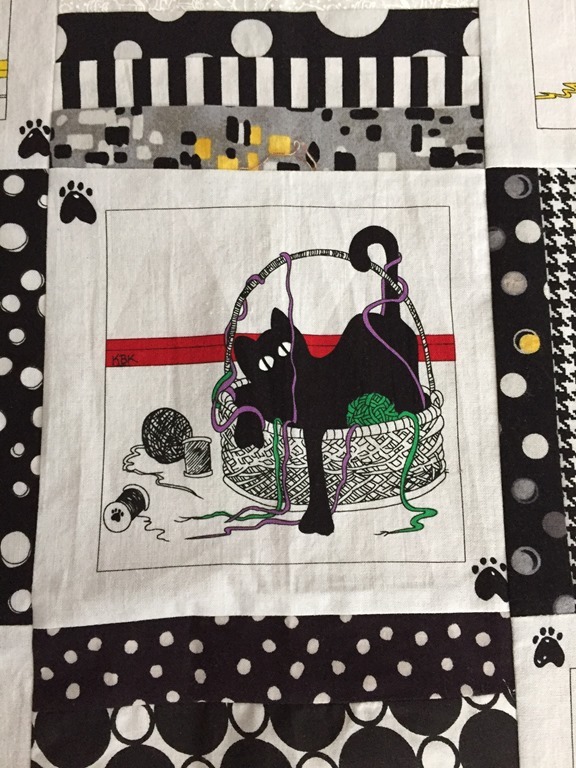 Once sorted, I had four piles—a selection of Black & Whites, a pile of Christmas fabrics, a pile of baby/kid’s prints, and a pile of great “earthy” traditional/county colors. After sewing enough strips together, I cut them to a perfect 6-1/2” square with my rotary cutter and ruler. Easy-peasy! or playing (and getting tangled) in the yarn. I just HAD to use it. 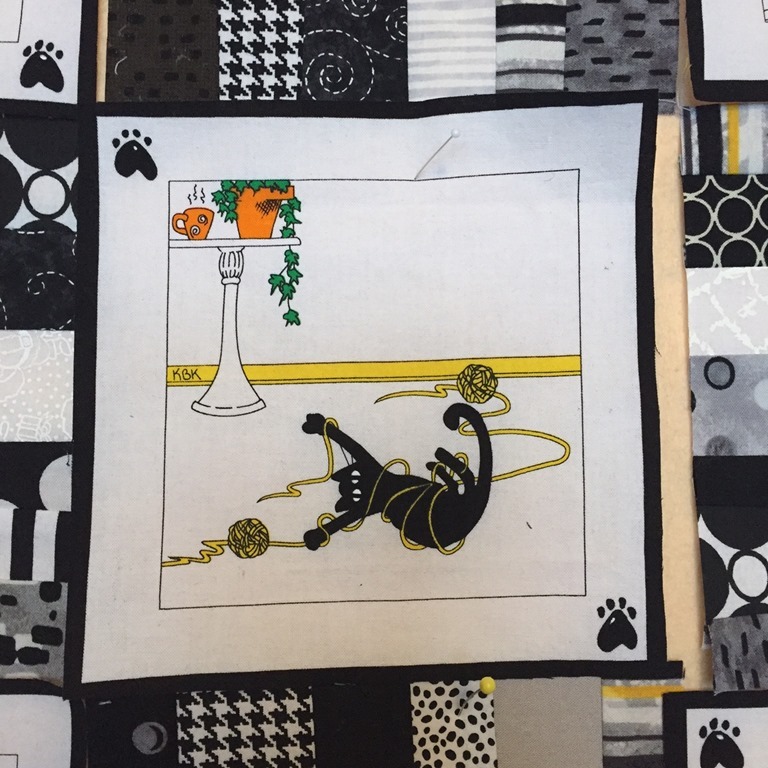 It’s called “Kats by Kelly’” for Timeless Treasures (I found the title in the selvage, which I added to a block). The scrap blocks were arranged to surround each of the cut panels (which magically cut to the perfect 6-1/2” size! …It was meant to be!). Kitty in the yarn again! 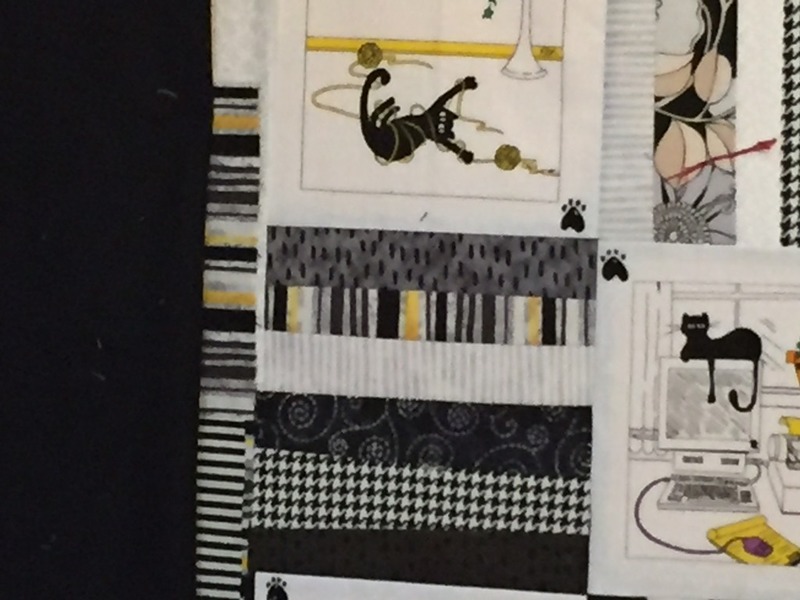 Here I’m auditioning different fabrics for an inner border & outer border — too much! Not bad…but I don’t have enough (and it’s still a bit loud). This is more like it…but not quite. 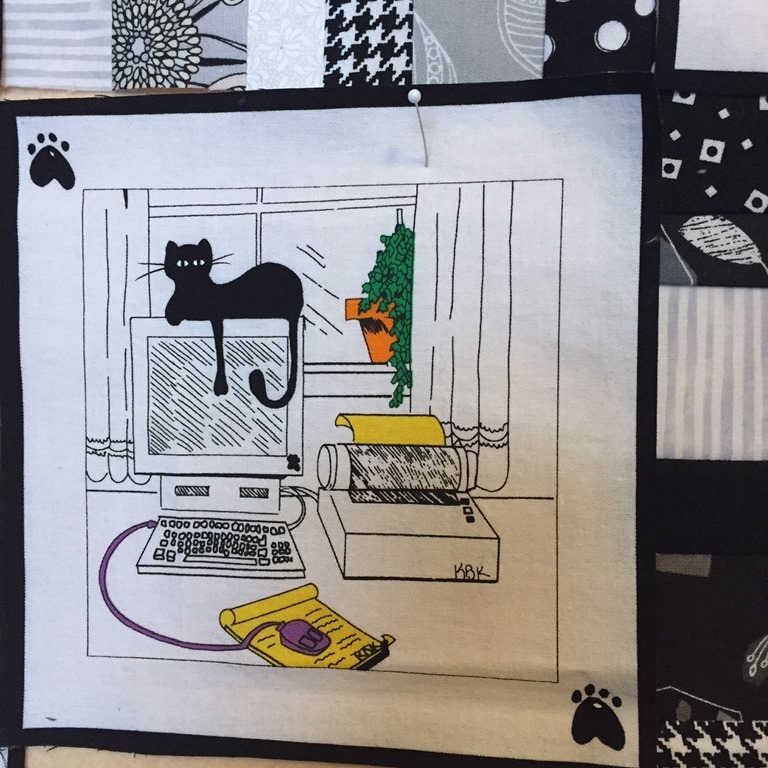 In the end I went with a narrow black inner border and some cute (lighter) fabric for the larger border, which I’m using for the backing as well. All that’s left is quilting & binding. 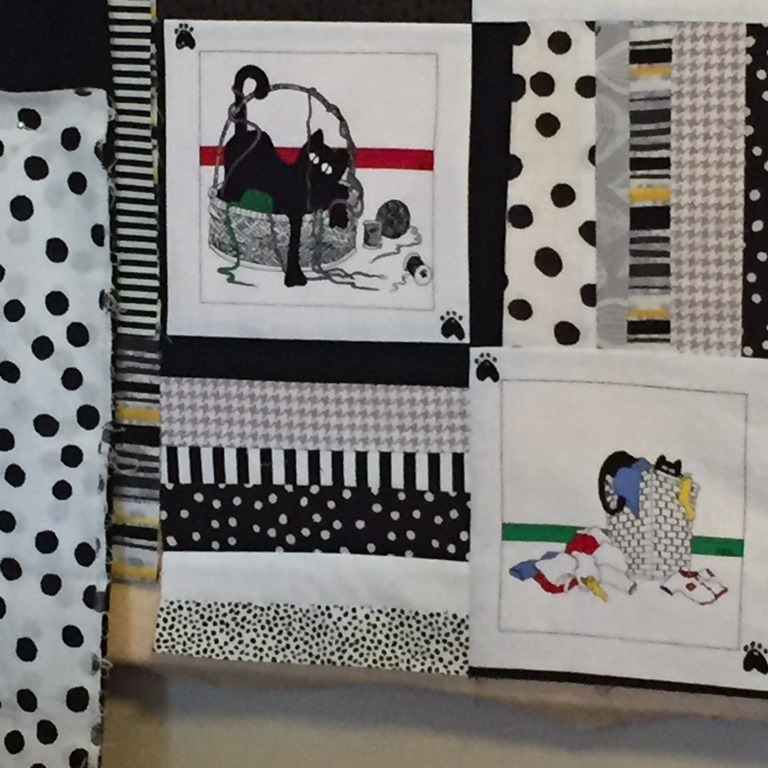 Three more scrappy quilts to go: 1) Christmas; 2) Baby/kids; & 3) traditional/country fabrics. So what do you think? Isn’t it a great way to use up scraps? 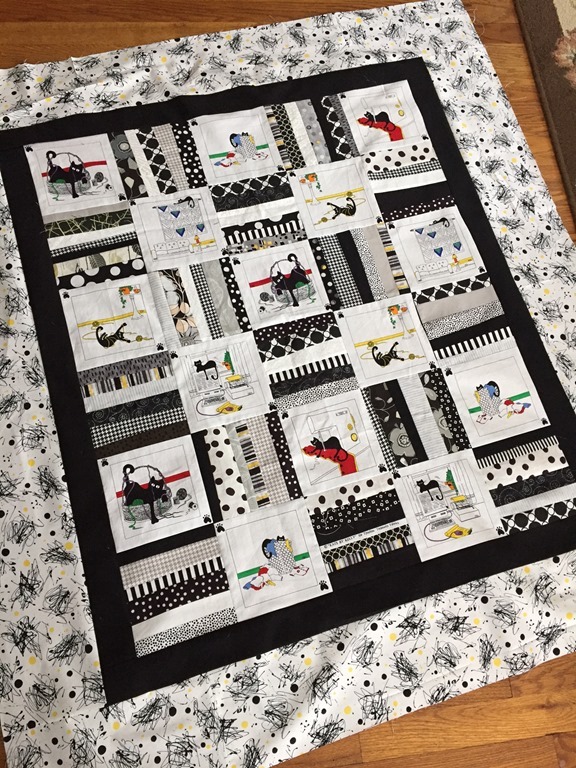 I’ll share a pic of the finished quilt with you in a week or so.